SPENDING time on, in or by the water is time well spent. Whether paddling, snorkeling, diving, walking or even sitting beside the water I tend to come away from such aquatic experiences with a new set of eyes that allow me to see the world a little differently. With a friend in town for the weekend, we had made plans to attend the Algonquin of Whitney and area’s 24th annual All Nations Gathering in Algonquin Park and then go for a midnight paddle to take in the Perseid meteor shower. Noticing that a perfect summer day was upon us when we arrived at Lake St. Peter, we changed plans, choosing to visit the Algonquins’ seasonal celebration the next day so we could spend the day on the water instead. Putting the canoe in at Rock Lake we dipped our paddles in the warm water of the Madawaska River with our sights loosely set on the Lake of Two Rivers as our destination. Hugging the shoreline for almost an hour, we slowly followed a belted kingfisher that seemed to be leading us in the right direction. Floating in the shallows, sharing stories from the past and our immediate observations, we drifted into the cattails and lilies that defined the water’s edge. Recognizing that our current location was perfect habitat for the great blue heron, a bird I have been trying to get a picture of in-flight for years, I quickly amended the settings on my camera to suit the light, just in case we happened to cross paths with one of these prehistoric-looking birds. Seconds later while gently navigating a sharp bend in the river, we refocused our attention skyward to locate the origin of the sound of wings flapping heavily overhead. 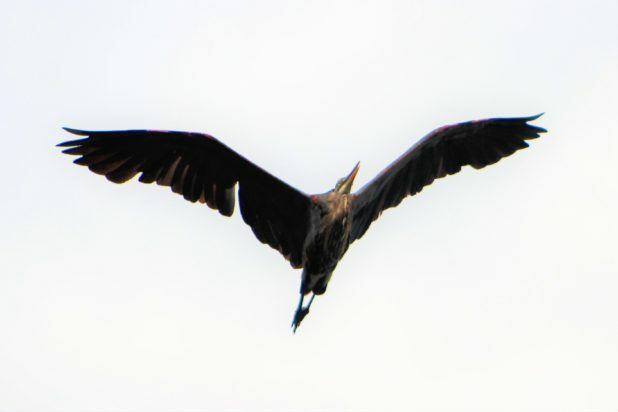 There, directly above us was the winged-one I had been waiting for – the great blue heron. Doing my best to focus my camera on the fly, I fired off a couple shots as soon as I saw its dinosaur-like shape silhouetted against the blue sky above. As I pulled the trigger on my Canon, Farley Mowat’s book Sea of Slaughter entered my consciousness, reminding me of how up until the 1870s misguided sports hunters would kill these beautiful creatures by burning them and their young alive in their colonies. No time for such dark thoughts of senseless cruelty on such a perfect day, I thought to myself as I spied another great blue heron standing still in the shallows awaiting a carefree frog or minnow to swim by. Lifting our paddles from the water again we studied its shape and spirit in a state of harmonious stillness. Letting the delicate breeze push us past the bird we began paddling again once it had faded into the greenery behind us. Noticing the belted kingfisher waiting for us on the limb of the snag hanging over the water in the distance we picked up the pace and continued on our way. By the time we caught up with our guide we could hear the sound of a drumming echoing across the water from the forest on the far side of what we soon discovered was Whitefish Lake. Allowing our curiosity to propel us forward we said goodbye to the belted kingfisher and began to follow the sound. With every stroke the music grew louder along with our curiosity. Peeking out from behind the tree-line we could see a long stretch of a somehow familiar rock face towering over us. Not recognizing it at first because we were viewing it from a different angle, we soon realized it was the Centennial ridges that we had spent six hours hiking a few weeks earlier. Seeing the magnificently adorned dancers through the forested shoreline and listening to the music at full volume, we had also somehow found our way to the Algonquins’ All Nations Gathering. Watching the dancers as they stomped in circles to the heartbeat of the drums, we took time to rest our bones while appreciating the experience we were obviously meant to have that afternoon. Getting back to the campsite on Lake St. Peter just in time to see the sunset through the trees, we threw a pizza on the fire, devoured a few slices each before taking the canoe down to the beach to observe the Perseid meteor shower rain down reflections of light over the water. Although there was a relatively heavy mist rising from the surface of the lake it did nothing to hinder our view of the heavenly bodies burning up in the Earth’s atmosphere. Drifting back to the beach the last meteor we saw before we hit land illuminated the sky with more light than any of the other others we’d seen that night combined. Stretching out on the sand to absorb some more of the show I did my best to process how my worldview had been altered by experience in the past 24 hours. Acknowledging the uniqueness of each body of water we had explored, I thought back to the conversation I had earlier that week with Algonquin Elder Margaret Haskins about the spirit of water. Explaining to me how the theme of this year’s gathering was water, the gift of life, she described to me how the Algonquin people viewed all living things, including the water, as having their own spirit. She also pointed out how because nothing can exist without water we need to respect and protect it if we wish to sustain our own existence. Gazing beyond the black tree-line that connected the sky to the water with a new set of eyes, and absorbing the sounds with wide open ears, I breathed in deeply a fresh appreciation for the spirit of Lake St. Peter.